5000 people joined a rally in Rennes, France, on Saturday to stop the Notre-Dame-Des-Londres (NDDL) proposed airport and the evictions of historical occupants from the site. From IndyBay. 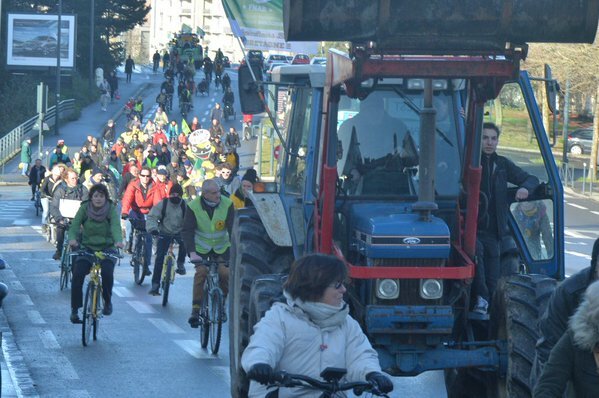 The event was called “backhoe cycling” and provided three assembly points with processions which took off at 11 am to converge on the city of Rennes Town Hall. The proposed airport is contentious with the proposal being in train since the 1970s and being supported by the French state Prime Minister Manuel Valls and Loire-Atlantique Regional President @BrunoRetailleau. Opponents argue that the existing Nantes Loire-Atlantique airport is far from operating at capacity for the runway, while the terminals could be renovated and expanded to allow for better passenger processing. The site of the new airport, 15km north of Nantes, is on agricultural land and wetlands which supports 130 protected species, including 5 species that have not been adequately considered in the project environmental assessment. The Construction company Vinci is determined to start clearing work at the end of January, but there are historical occupants and others occupying the site to defend the site from construction of the airport. On Wednesday there was a hearing at the Nantes Court of Justice into the evictions. A decision by the court will be handed down on 25 January. Outside the court 3000 people rallied against the airport against the evictions. Last Saturday, 9 January 2015, 20,000 Nantais marched and rallied on the Peripheral ring road around Nantes in opposition to the NDDL airport and eviction of the traditional inhabitants and present occupiers of the site. The new proposed airport has been highlighted for it’s sustainable design, yet activists believe this is greenwashing the project. Nantes does not need a new airport. In the project specifications there is a lack of detail on public transport connecting the airport, such as a local tram from Nantes or the TGV high speed train service to connect with Paris. The argument has been made that a new airport is needed to replace the existing airport, yet the existing airport is far from reaching aircraft traffic movement capacity. If bottlenecks are in passenger processing, it is an argument for upgrading the existing passenger terminals, not for building a totally new airport. Added to this is the loss of productive agricultural land and wetlands environment which hosts many protected species. Offsetting wetlands for protection elsewhere is seldom sufficient in compensating species and habitat lost to development. As well as the high amounts of CO2 in building such an airport, flight carbon emissions are continuing to increase posing a real threat to efforts reduce greenhouse gas emissions and climate change. Shipping and flight emissions amount to 5 per cent of total global emissions and are rising faster than any other sector. Although consideration of flight emissions were in early drafts of the Paris Agreement, they were dropped entirely from the final text. There was also a substantial support rally and march in Paris, with a very positive atmosphere, although with a heavy police presence due to the continuing State of Emergency. Nantes Indymedia listed numerous regional cities where #NDDL support rallies would be held on Saturday 16 January. These included: Agen, Bordeaux, Bourges, Caen, Dijon, Forcalquier, Guigamp, Lille, Lyon, Montpellier, Paris, Pontivy, Quimper, Souvache, Tarbes, Toulouse, Rouen. Bastamag report (fr) goes into the escargot (snail pace) protests during the week which resulted in farmer arrests and impoundment of tractors by police. Good report of the rally (fr) from 20Minutes. The Guardian has some background to the current protests, well worthwhile reading. Previous Indybay reports: 3000 strong protest midweek at the Nantes Palace of Justice evictions hearing, and the 20,000 strong protest on the Nantes ring road on Saturday 9 January 2015. For more detail,including images, some video see my Storify curation of tweets and social media with regard to the protest. John Englart (@takvera) travelled to Paris to report on the United Nations COP21 climate talks in December 2015 for Australian citizen journalist site Nofibs. Along the way he spent 3 weeks in Brittany including one week in Nantes.